Capture life's photo opportunities with these thoughtful presets.  Fast Foto helps you snap that group pic with one tap. It waits a few seconds before snapping two fotos (just in case). 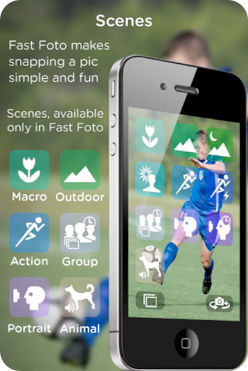 Action - Great for fast objects, snaps a burst of fotos. Animals - Whistles and snaps two fotos. Group - Snaps a burst of fotos after delay. Landscape - Great for outdoor fotos. Macro - Snap a foto of an object up close. Capture life’s memories with any combination of your camera’s features. Thoughtful combinations to help snap the foto you want. Snaps a preset number of fotos. Waits a few seconds before snapping a foto. Set a 2, 5 or 7 second pause. Snap a foto in the dark. AUTO mode for flexible shooting. ON mode to always use a flash. 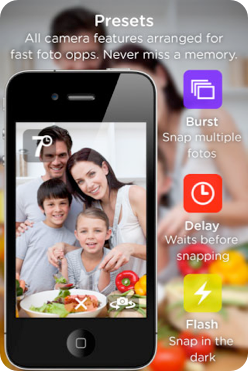 Fast Foto is a simplified camera to snap the pic you want with one tap. 2 Ways to Shoot: Fotos a la carte with Presets. Tell a story with Scenes. Buttons preconfigured with the above features (such as delay, burst, etc) for a fast foto with the settings you want, so you'll never a memory. Stills are saved to Fast Foto's gallery. Videos are saved to the device's Camera Roll. Notes: Compatible with the iPhone 4 and iPod Touch 4 only. Portrait - Snaps two fotos with front-facing camera. Copyright © 2014 Bobby Cronkhite, All rights reserved.